This is an image taken from the DVD that I sell on this site. I am dancing Yoga to music and this is The Wheel. The DVD (YogaNata) shows the goal. The book gives detailed preliminary instructions. If a link from the 1st Root Chakra (Muladhara) series brought you to this page, this posture is quite specific for opening up that area of the Chakra system. However, these postures can be done by anyone for many other reasons. Here are some preliminary stretches to help you attain the final goal. A link provided below will take you back to the next page in the Chakra series (the 2nd Chakra). Begin by standing and stretching up (image left) to form the top of the wheel above you. Walk around as you lift yourself up. The legs should be tensing where the dots are on my leotards here. Feel the stretch from the inner part of your leg muscles up to your buttocks and then to your abdomen and into the sternum (solar plexus, just below the breast). From that point above, your upper body should be loose while you reach up above you into space and stretch your arms, hands and fingers. They are both up, but you are only stretching one at a time as high as you can. Look up and stretch your chin up high. As you stretch your right arm up above you, you will be taking a step up with your left foot as you stand up on your toes. It's like stretching while you walk, one foot and arm at a time (opposite sides). If you stretch with intention, and visualize the dots moving up, you will feel the difference from this very simple stretch. It will help to prepare you for the Wheel posture. Now that you have stretched your body as high as you can, you will begin from a standing position to stretch back. 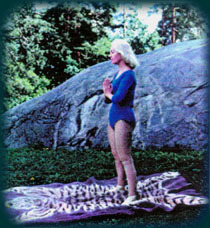 Stand with your back straight and your feet shoulder-width apart (as Eugenia shows in the image, left), which is the setup for the Moon Salutation provided on this site). Place your palms together, as shown. Stretch your toes so they are flat on the floor. Your weight will be evenly distributed on the balls and the heels of your feet. Get a sense of how that feels—that the soles of your feet and your toes are connected to the earth beneath you, rooted like a tree. Breathe slowly and feel that you are stable, balanced and relaxed in this standing pose. If you are not relaxed, breathe slowly until you begin to calm down. Make sure your body is relaxed. Visualize your body as a a wheel from the small of your back. Get a rolling sensation in your mind with your spine, but don't stretch that far yet. From the above standing position, put your hands on your buttocks and slowly stretch forward with the small of your back. Bend your knees slightly forward. Push the pelvic region forward and let your spine arch back. This is one way of getting into the Wheel. There are others given below. Stretch your elbows in behind you, tight, together as much as possible. This will help to stretch your entire torso. Feel the weight of your body in your thighs and your toes. Inhale and continue moving back as long as you feel comfortable, then stop. Do not push yourself in this posture. It will only defeat the purpose of finally attaining the full posture with ease. Inhale and exhale and keep your body still in this stretch. If you are not agile enough to already reach to the floor, easily, keep your head straight with your chin forward, looking in front of you instead of above (to prevent neck injury). If you can continue, exhale and bring your hands down to the floor behind you. Imagine that there is a string in your navel that is lifting it up as high as possible. Some people prefer to come up from the floor to this posture (see below). If you have come this far, stand on your toes. Hold this position. Allow your neck to just relax so your head will just hang there, no strain in the neck or shoulders. Breathe with your abdomen, in out in out, and feel the energy coming into your buttocks and into your entire body from your toes to the top of your head. With inhalation, get out of the position comfortably by lowering your buttocks to the floor first. Do not try to lift your head from this position. Come down slowly with your buttocks first, then it will be much less strenuous on your neck to bring your head forward again. Do this only once. The entire time you are doing this, focus on the Muladhara (Root Chakra) and visualize the color red (the color of a brilliant red rose) filling the muscles and allowing you to move freely and open that area as much as you can. This will help you stretch more. You can also just imagine the color red filling the Root Chakra with your incoming breath and watch it spread throughout your body. Caution: If you have any fear of falling, or if this posture is too difficult for you, do all the preliminary stretches given above. You can also begin by lying on the floor and train for this position (above) by lifting yourself with your hands from the floor instead. Start from a supine position, place hands on floor above shoulders, palms down with fingers facing your shoulders, or pointing in the opposite position. Some people find it easier this way. Do what is most comfortable for you. If you can do this without a problem, sit down again and bring your feet, flat on the floor, as close to your buttocks as possible by using your hands to pull them closer to you. Bring your hands behind you again and lift from your navel up to the ceiling. Imagine that there is a string pulling your navel up high. Once you can do both of these positions, it will be easier for you to do The Wheel. There are various ways to get into the final posture, so choose the one that works for you. And of course, by practicing all the postures on this site, your body will eventually be able to get into this position without a problem. Just be patient with yourself. There is no need to rush, ever. This is especially beneficial for the spine and to strengthen the arms and wrists. If you have back trouble, start with the preliminary position on the floor as instructed above. If you have severe back trouble, stand and let your body sway back gently while you breathe slowly. Do not attempt this posture if you have acute back pain. And for those of you who came to this page from the 1st Root Chakra (Muladhara), this posture stretches your entire body from your toes to the tip of your head. This has an opening effect on the 1st Chakra. Also, don't forget the Kegel exercises given for this Chakra in that section. They are very important. If you want to return to the next Chakra series, you can continue from this page to the 2nd Chakra—Svadhisthana, which would have been the next page in the series for you.